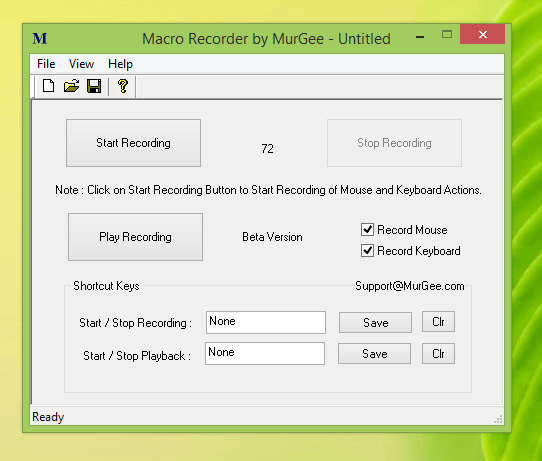 Recording Mouse Clicks and Keystrokes is now easy with Macro Recorder to Automate Repetitive Actions. This post presents two different and unique ways to create your Macro Script which can Automate almost anything. Whether you need to repeat an action in a Game or need to automate a complex and repetitive task, the information provided here can be really handy and worth giving a try. 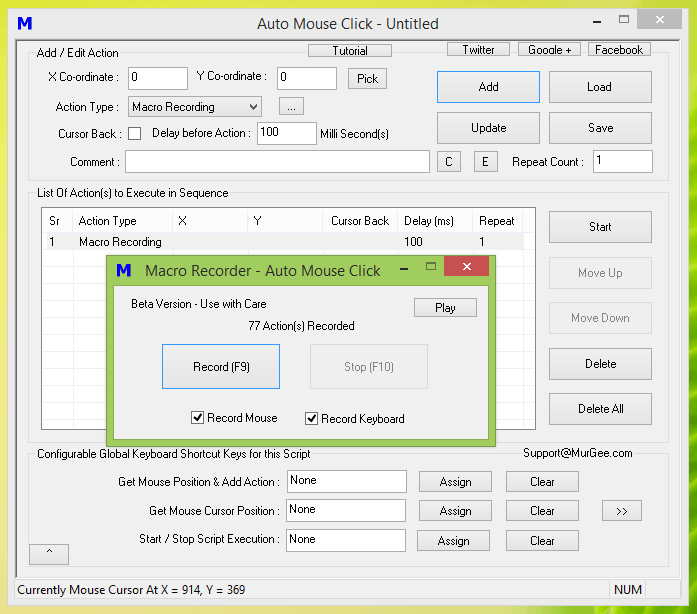 Simple and Quick way to Record and Playback Mouse Actions like Single Click, Double Click, Scrolling, etc and Key Pressing is to use the Macro Recorder as displayed in the screenshot above. Note that there are two different configurable keyboard shortcuts which allow you to fully control the software. When Recording, you can enable or disable Mouse or Keyboard Actions. Note that you can save the Recorded Mouse Clicks and Keystrokes in a data file and load it later. This Macro Recorder plays back exactly whatever you have recorded. When Recording Mouse Actions and Keystrokes, there is lots of Data Recorded by Recorder. Mouse Movement, Time Delay between consecutive Human Input, Pressing Down Mouse and then Releasing it for recording a Mouse Click, pressing and then releasing of a Keystroke to record a Key Press and much more. Editing such huge data can be cumbersome and hence, an alternative way to record and playback Mouse and Keystrokes is to use a Macro Editor with functionality to embed a Mouse and Keyboard Recording in it. 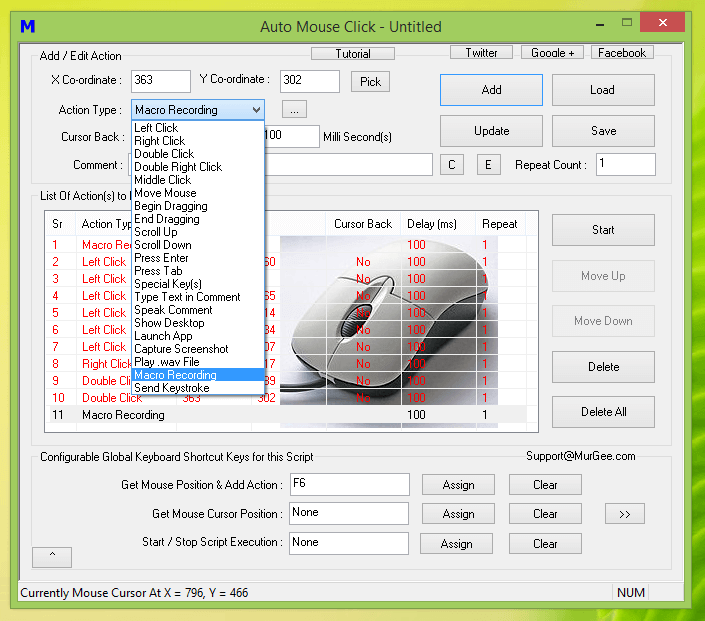 Having a Macro Recording containing Recorded Mouse Clicks and Keystrokes in a Macro Recording and simultaneously having the functionality to add or edit other Mouse Click and Keystrokes is offered by Powerful and Cheap Windows Automation Tool. Yes you need to plan your repetitive task into parts, so that you can have your fixed and repetitive task in a single Macro Recording and other changing parameters added as separate actions in the Macro Script. 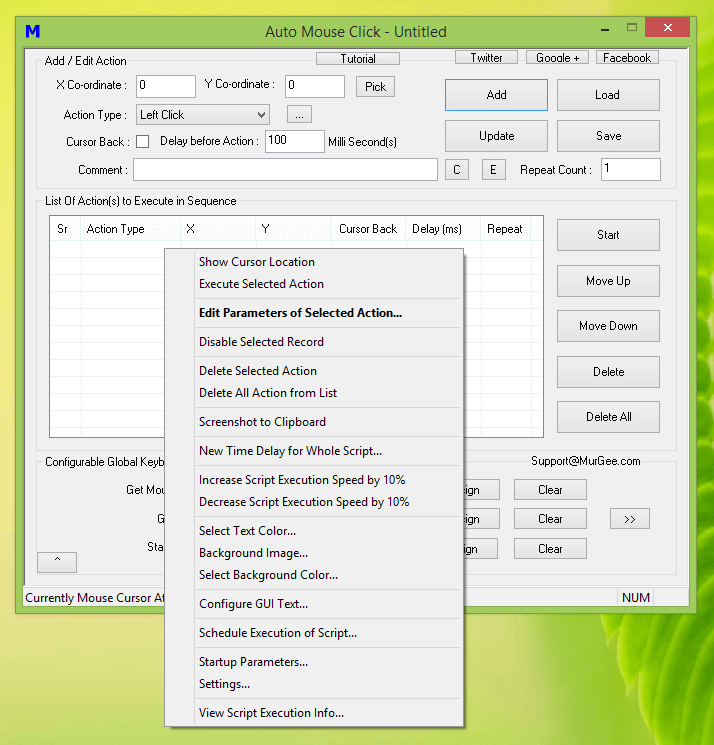 The above Screenshots displays an Easy to Use and yet Powerful tool to assist you in Windows Automation. Whether you wish to repeat your Mouse Clicks single or Multiple Times, need a helping hand to automate Text Typing, both the Macro Recorders are versatile and powerful tools available for download. Watch a short introductory video tutorial displaying both of the above mentioned ways to Record and Playback Mouse Clicks and Keystroke. With a little planning and understanding, this Auto Mouse Click Utility for Windows. When Playing back a Macro Recording (containing Mouse Clicks and other Mouse Actions), do make sure that Screen Resolution is the same as was during the time of recording. Recording of Mouse Actions is done by taking into consideration Mouse Cursor Location which is measured in terms of X Axis and Y Axis Location and is affected by changes in Screen Resolution. 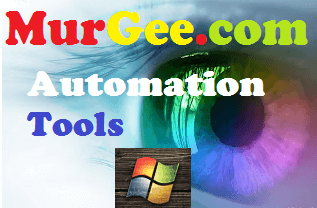 All the above Screenshots above have been captured on Windows 8.1 Computer, however you can download and use this Windows Automation Utility on any Windows Computer running almost any latest Windows Operating System like Windows 10, Windows 8, Windows 7, Windows Vista, etc.